After this, I had to learn a little bit about the GPIO. The General Purpose Input/Output is an interface available on some devices capable of getting inputs and sending outputs. 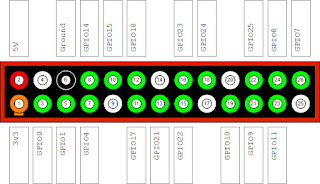 In the RPi, this is the male pins situated on top of the RPi logo in the latest devices. 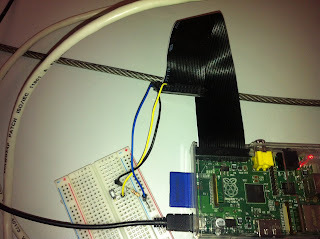 Today what I will do is connect a simple button and trigger some event on the RPi. The event will only be a print line saying something. The purpose of this test project was to get my hands dirty a little bit with the RPi by starting with something extremely simple. Place the button on the breadboard. On the row of one pin of the button, I had to connect one head of the resistor. The other head had to be connected on another row. 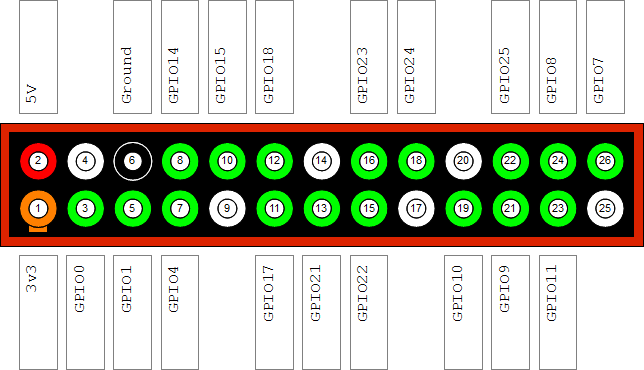 On the same row of this head, then, I had to connect the 3v3 pin (pin 1) of the RPi. To do that I had to use the ribbon and then use a wire from the other end of the ribbon. I have chosen to use the pin called GPIO17 on the image shown. From that pin I connected a wire which was placed on the same row in which one head of the button and one of the resistor were placed. Finally, the ground pin was connected to the other end of the button. Be careful and respect indentation as Python will complain otherwise. I have chosen pin 17 but any GPIO pin will work as long as you change it in your code. The code is extremely simple: with a while True it checks if the button has been pressed. If that is the case, then, it will print the message. While the button is pressed it will just fall into the second while statement. And that's it. Here is a picture of what I built. As you can see, the blue wire is the 3v3 pin, the yellow one is the GPIO17 while the black one is ground. I hope to build some cooler stuff and show it here. Have any issue related to AOL, AT&T ?? Our expert technicians suggest about the maximum possible solutions for account live password reset. Our toll free account.live.com/password/reset number 1-800-436-6070 is open and in working mode 24X7. >Our outlooks-live expert technicians suggest about the maximum possible solutions for your issues. customer support toll free account.live.com/password/reset number 1-800-436-6070 is open and in working mode 24X7 or visit our website. To activate Norton visit norton.com/activate and verify product key or Get Technical support for norton.com/setup download, install and online activation. If you do not have Norton subscription do not worry call customer support 1-800-436-6070 toll free. During any of these processes, if you face any trouble then contact our mcafee installation toll-free number 1-800-436-6070 USA or Canada for an instant support by a certified technician. We provide support for all mcafee.com/activate errors including help more visit our website. your Microsoft account is locked out, you won’t be able to access your computer or Laptop. So how do you get account live password reset this the answer is actually quite simple. Instead of account.live.com.sign in with the online Microsoft account.live.com/password/reset call 1-800-436-6070 toll free. If your apple id locked you want to change your forgot apple id password to another third-party email address, you need to verify your account after you enter the email address that you want to use as your apple id reset more detail please visit our website or online chat. Your apple id password reset is the key to all Apple services. You use it on your iOS device and your Mac. You log in with it to iCloud the apple id password reset Store, and more if you forgot apple id password visit our website help our expert online.